1.Bass Guitar EQ Multiple sources differently to create one great sound. i. With the first source, the DI, control lows and highs with EQ filters- Using a stock plugin, set around 170-200Hz, and everything above that is low passed away. 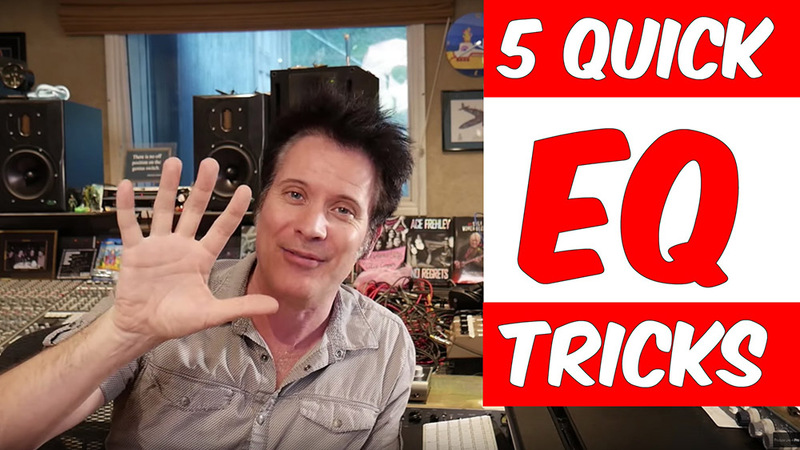 After that is another EQ, which is a less than 60Hz (this can drop lower to 40hz) and gently sloping, controlling the low end, giving room for the Kick Drum. ii. With the Bass Amp High Pass at the same point around 170-200hz allowing the high end of the Bass Amp to give the sound personality. iii. You can also duplicate the Bass Amp and follow the same steps above but also use to add additional Saturation or Distortion to help it glue together with the guitars. Boosting high end on Electrics really help them cut, high passing gently creates room for the Bass and Kick to breath. Some notes, especially with saturation can get very aggressive so after boosting EQ place a DeEsser set to catch the occasional aggressive and potentially ear piercing notes that may occur! This trick allows the whole electric to feel brighter but never too bright that it detracts from the vocals and loses it’s place in the mix. When you have 2 or often 3 mics on a kick drum the polarity will never be exactly the same. The mics are placed in different places and hear the kick completely differently. Sculpting your multiple mics so there is only one clean source of low end can add more weight to the Kick especially when summing the Kicks and adding a low end boost from a plug in such as an RBass or equivalent. Live Room ambience is an amazing addition to your drum sound. Be careful to control the Low End in your rooms, too much floppy low end will add long sustained 40-60hz kicks reverberating around taken the impact of your kick away, creating a huge amount of low end mud and destroying clarity, making it impossible for a Mastering Engineer to bring out the definition of the Kick Drum. Also cut low mids around 200-500hz, for instance a fairly wide cut of 3db at 350hz does an amazing job of reducing the low mid build up in the drums! High Passing before your reverb will really help open up your mix! Excessive low end being exaggerated by Reverbs will add to an enormous amount of mud in your mix. Low Passing before your Reverb will also stop excessive highs that interfere with the vocal, taking away the impact of the singer. Low mids down (200hz) can easily be high passed often and on instruments like the Kick anywhere from 3-5k and above can be gently Low Passed with 6db per octave or greater.